Welcome to your test drive of Snap Schedule Premium. In the next few minutes, I’ll show you how to install the software, set up your free trial, and start exploring. If you haven’t already done so, please go to www.SnapSchedule.com, and click on “Test Drive.” On the sign up form, enter your contact details, choose a “company code” (that is, a name to identify your company), select a username and password, and click “Submit.” You’ll receive a confirmation email. Click the link in that email to confirm. Then, click on the button to download the installer to your hard drive, and run it to install Snap Schedule Premium. Now, click the icon on your desktop to launch Snap Schedule Premium, and start your 30-day free trial. As part of your test drive, we’ll host your database in the cloud, absolutely free. Just click on “Use Snap Data Service” at the top of the welcome screen. To help you get started, we’ve provided complete sample databases for typical companies in a variety of industries. Just double-click on the one you want. Enter the company code, username, and password you chose when you signed up, and click “Login.” In seconds, you’ll be ready to start exploring our software and learning its capabilities… with absolutely no data entry. Or, if you like, you can create a New Database from scratch. You can use the wizard to create a blank schedule, or choose from more than 30 shift patterns to create a simple recurring schedule. Then, start building a unique, custom schedule for your real employees. Once you’ve loaded a sample database or created a new one, you’re ready to start exploring. You’ll spend most of your time on the Schedule tab. Here, you can choose how to view your schedule. For instance, you can choose Daily view for a list of your employees, and their color-coded assignments for the day. Or, choose Calendar view and click on an employee, to see all of their shifts for the month. Just choose a shift from the sidebar and drag it onto the calendar to assign it to that employee. You can also choose Shift view for a list of employees working a particular shift—and then, drag and drop an employee from the sidebar, instead. And when you’re ready, you can Email your schedule to your staff. Go to the Manage tab, and you can add new employees to your staff, define their positions in your company, set up teams who work together, and so on. You can also click on “Reports” to generate assignment calendars, timesheets, and more. Just click on the down arrow and choose which report in the group to run. You won’t be able to print or export these documents during your free trial… but you can see exactly what they’ll look like when printed. Visit the File tab, to manage your database, import employee data from Intuit QuickBooks or MS Excel, and get help from our Learning Center or from Tech Support. If you like, you can share your test drive with your managers. Just go to SnapSchedule.com and click on “Account Info.” Enter your company code, username, and password to log in. Click on the “Users” tab, and then click on “Invite New Application User” at the bottom. Give your manager a username, enter their contact details, and click “Submit.” They’ll receive an invitation to download a free trial of Snap Schedule Premium, and log in with your company code, their new username, and a password, so they can access your same database and help you schedule your staff. You can even let your employees access their schedules on the go. Just go to the Manage tab, click “Employee Access,” and then check off which features you’d like them to use, set any special options on the right, and click “OK” to save. Then, click on “Employees” for a list of your staff, and double-click on an employee’s name. Notice the employee’s unique code; this will be their username. Click the “Contact Info” tab, and then check the box at the bottom to allow this employee to use Employee Remote Access (ERA, for short). Give them a password, repeat to confirm, and click OK. Now, your employee can go to ERA.SnapSchedule.com, or download our free app from the App store, and log in with the company code, their employee code, and the password you just set up. Depending on the options you’ve chosen, they can review their schedule, update their availability, bid on open shifts, and even punch in when they’re ready to get to work. Explore the interface, try our sample databases, and share your test drive with your staff, and you’ll see how easy employee scheduling can be. If you need help, you can hover over any button on the toolbar for a quick tip. Click the question mark at the top right for more help. Visit our website for a complete set of video tutorials. Reach out to our friendly support team. 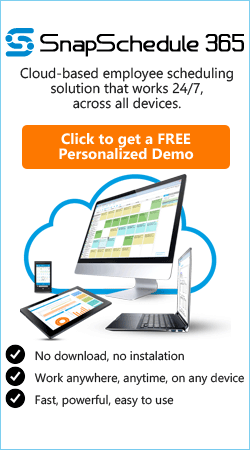 Or sign up for a free personalized demo and consultation, so we can show you even more.